What is the strong force? Our understanding of atoms as being made of smaller subatomic particles began with the discovery of the electron in the late 1800s. 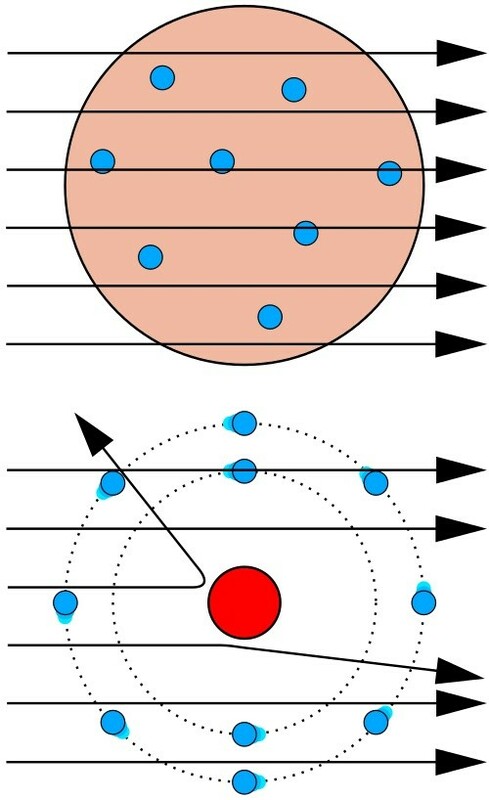 After we learned that electrons were negatively charged, and that removing electrons from an atom left it positively charged, it was thought that atoms must be held together by electromagnetic forces. There were several proposed models, but one of the most popular was known as the plum pudding model. 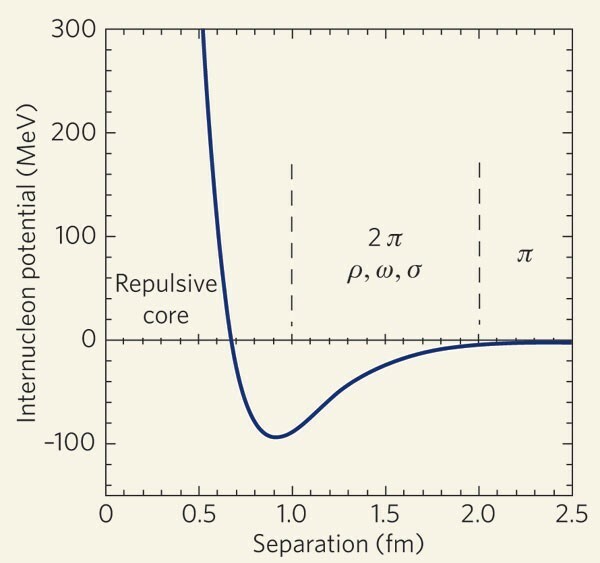 This proposed that negatively charged electrons were held in a positively-charged atom like plums in a pudding. But in the early 1900s Ernest Rutherford scattered alpha particles off thin layers of gold foil and found that atoms consisted of dense, positively charged nucleus surrounded by electrons. It was soon found that atomic nuclei consisted of positively charged protons as well as neutrons that had no charge. While it was clear that nuclei and electrons were held together by electromagnetic forces, we had no idea what held nuclei together. What could possibly hold protons so close to each other, given the immense repulsive force due to their charges? Since atomic nuclei also contained neutrons, it was easy to imagine them acting as some kind of “glue” which held protons together. Since neutrons have no electric charge, this couldn’t be done by electromagnetism. There must be some new force strong enough to overpower electromagnetic forces. In the 1930s, Hideki Yukawa proposed that the force between protons and neutrons could be mediated by a new type of quantum particle, just as electromagnetic forces are mediated by quantum photons. Unlike the photon, this particle would have mass, and as a result the strength of the strong force would die off exponentially with distance. It would also be repulsive at extremely close distances. This meant the strong force would have a distance “sweet spot” to hold protons and neutrons close to each other while not causing them to collapse into a singularity. By the 1940s we began to develop the tools of particle physics, and this intermediary particle known as the pion (or pi meson) was discovered. It seemed like we were finally beginning to understand the strong force. But over time we began to find more and more particles. In addition to the proton, neutron and pion, we found a range of others. They could be charged positively, negatively, or not at all. Some of them were heavy, like protons and neutrons (known as baryons), while some were lighter like the pion (known as mesons). Many seemed to have some similarities in behavior, but it was unclear just how they might be related. Then in the 1960s Murray Gell-Mann and George Zweig argued that all of these particles were themselves made up of more fundamental particles they called quarks. In this model quarks not only had electric charges of 1/3 or 2/3 the charge of a proton or electron, they also possessed a strong charge or “color” charge. Although strong charges are not actually colored, the color analogy is useful because of they way they interact. With electric forces there are just positive and negative charges, and an object is electrically neutral if its charge sums to zero. With the strong force there are three types of charges: red, green and blue, and three “opposite” charges anti-red, anti-green and anti-blue (or less commonly cyan, magenta and yellow). To be strong neutral, the color charges must sum to “white.” Following the color analogy, red + green + blue adds to white, so it is neutral. So is red + anti-red, or green + anti-green. 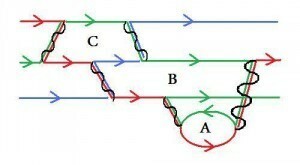 In this way, baryons are made of three quarks (one of each color or anti-color) while the lighter mesons are made of two quarks (a color anti-color pair). Feynman diagrams for strong interactions. From this we’ve been able to develop a model of the strong force along the lines of quantum electrodynamics (QED) for electromagnetism. Since the strong charges are “colors” it is known as quantum chromodynamics (QCD). Like QED, quantum chromodynamics can be expressed as Feynman diagrams, but instead of charges exchanging photons it is quarks exchanging strong field quanta known as gluons. There are many similarities, but also some important differences. In electromagnetism, photons are both massless and chargeless. This means, for example, that they can interact with electrons without changing their charge. An electron is always negatively charged before and after interacting with a photon. Gluons are massless, but possess color. Just as charge is conserved in electromagnetism, color is conserved in strong interactions. This means if a quark emits or absorbs a gluon it must change color. As a result, the specific color of an individual quark is indefinite. While we can say that the quarks of a proton have color charges that add to “white,” the fairy dance of quarks and gluons means that color charge is tossed back and forth between quarks. So quarks have color, but not a specific color at any particular time. If that’s not strange enough, since gluons have color themselves, they interact with each other as well as the quarks. This is a dramatic difference from QED, where photons only interact with charges. Because of their interactions, gluons will tend to cluster in the region between quarks. If you could grab two quarks and try to pull them apart, the gluons would form a flux tube between them. One of the ways gluons can interact is to create a quark anti-quark pair (just as a photon can create an electron-positron pair). Given enough energy, eventually some gluons would interact to create a pair. The flux tube would then snap, and you would be left with two baryons or mesons. The overall effect of this complexity is that you can never isolate a single quark. 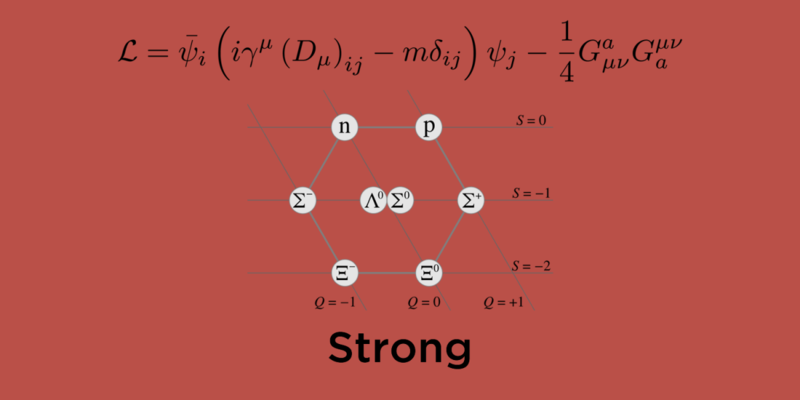 The strong force ensures that quarks cluster into color-neutral groups of two or three (and perhaps four). 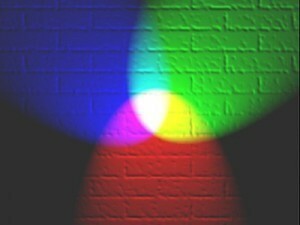 It’s an effect known as color confinement. It’s taken us decades to understand the complexities of the strong force. Even now the calculations are so complex it takes powerful supercomputers to solve most of the equations. There’s still much to learn, but we now know that Yukawa was pretty close to the mark back in the 40s. When quarks are close together in a proton or neutron, for example, they tend to interact directly through the gluons. But the distance between a proton and neutron in the nucleus of an atom are more widely separated, and so they tend to interact when gluons produce a meson. Yukawa’s pion model is a good approximation, and there really is a distance “sweet spot” between protons and neutrons. Rather than simply being a jumble of quarks, atomic nuclei are distinct clusters of protons and neutrons that can combine into stable arrangements. This means not only that atoms can be stable, but that their nuclei can combine to create larger stable nuclei. At high temperatures and densities, hydrogen can become helium, helium can become carbon, etc. This type of temperature and density exists within the cores of stars, and through the strong force they fuse elements to produce heat and light. When you look up at the night sky, the stars you see are driven by strong force interactions. In that way the strong force truly is the forge of heaven. Tomorrow: The weak force takes us on an even stranger path. One that leads us toward the origin of life itself. I’m feeling smarter and I didn’t have to sleep at the Holiday Inn, thanks Dr. Koberlein. “…this particle would have mass, and as a result the strength of the strong force would die off exponentially with distance”. Why does mass cause a ‘force’ carrying particle to lose its strength exponentially with distance? I’m not a physicist, but from what I read on physics blogs, the pion is unstable, similar to radioactive atoms, and breaks into smaller particles fairly quickly. So if two nucleons are far apart, it gets harder for pions to reach one from the other. And the attractive force works through interchange of pions, so it becomes exponentially weaker with the distance. What’s a good book on this subject? Perhaps The God Particle by Leon Lederman. It’s focused on the Higgs boson, but it does give an overview of particle physics.